When his doting and over-protective daughter decides to go on a trek through the wilderness of Peru for a couple of months, George, with the help of best friend Charles, decide to plan a long trek of their own. Their trip consists of following the Tour de France in their car. 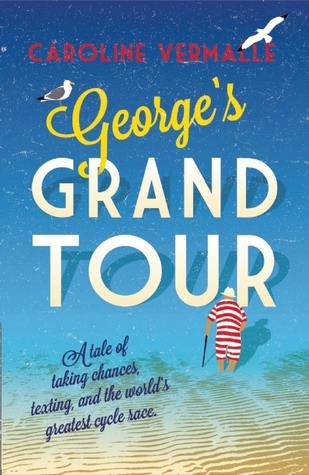 Plans almost go awry when George’s granddaughter Adele calls to check in on her grandfather. This book is unique in that it manages to incorporate modern-day use of technology without it being clunky or trite. Adele encourages her grandfather to text her everyday with a simple status of his trip. The initial brief texts eventually evolve in short journal messages of his voyage. Who he’s with, where he is, what he’s experiencing. He and his long-lost granddaughter reunite through these messages. This is a wonderful book about two friends setting off on a last great adventure in their lives, following the Tour de France. Fans of Major Pettigrew’s Last Stand will really take a liking to this novella by Caroline Vermalle. The characters are well-developed and the story has a wonderful flow to it. I wish I was travelling with George and Charles, seeing all the wonderful sights and tasting all the delicious food around France. It’s a story about family, about being true to yourself, challenging and valuing yourself and your worth. There’s a budding romance, self-discovery and personally challenges throughout the novel. It was basically the perfect length to tell such a short story. The entire book covers the nearly two months of the trip, with each chapter finding George and Charles in a new city, making new friends. All the characters manage to grow in some way in this short story. The chapters are very brief, usually 1 to 3 pages. The translation is done with England English, so there is some terminology that might confuse American readers (trainers = sneakers, jumper = sweater, etc). I just wonder how the chapter on pig-Latin must have been like in the original French text. I didn’t even know pig-Latin was a thing outside of the US. © 2015 by Nari of The Novel World. All rights reserved. You can also follow me @TheNovelWorld This was originally posted to The Novel World on 7/28/2015. Sounds like a wonderful book. It will go directly into my To Read List!